I have been inundated over the last year with Barber Shop products, with every salon and barber-revival shop creating their own products – most of them are average at best. Johnny’s Chop Shop is different (and the reason I’m posting it) as the products not only speak to me (I’m never going to use a beard oil) but their execution is much better and seems more thought out rather than just a clambered rush to market. 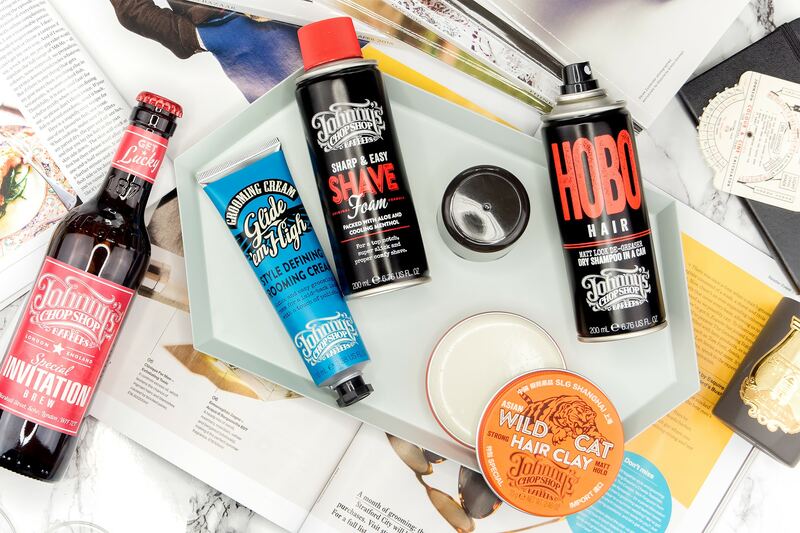 The collection is pretty vast with 11 products already, all of which have just launched in Boots stores and online, as well as in the London-based, Johnny’s Chop Shop. I’ve been using the hair cream, clay, dry shampoo and shaving foam. I’ll get it out the way, hair creams don’t work for me – I have very fine hair but an absolute tonne of it so have to avoid anything wet/sloppy as even though it can tame thicker, wilder hair, but makes mine go limp. Tried it, didn’t change my opinion. Johnny’s Chop Shop Glide ‘Em High Grooming Cream. Boots Online. £6. The shaving foam is luuurvely. It’s a standard butane can shaving foam but loaded with a little aloe and menthol to give a softening and invigorating shave. Really pleasant to use and will be keeping this in my bathroom cabinet for sure! Hobo Hair dry shampoo is amazing. It smells gorgeous and cuts through the grease in my hair like nobody’s business with it’s tapioca starch base. Really hefty and heavy duty plus feels much more appropriate to pull out of my bag than a bottle of Batiste. The Hair Clay is also another favourite. It gives great matte hold and really thickens my hair! I use a blowdry styler (usually Phomollient by Aveda or Neal & Wolf Sculpting Lotion) then this is just perfect for supporting and strengthening the style and gives a really long-lasting hold! This article first appeared on MANFACE written by Thom Watson. It was published on Tuesday 24th May 2016 and was last updated on Monday 3rd April 2017 at 12:55pm. It's categorised under Johnny's Chop Shop, Shave, Styling where you'll find more related content. Oh wow, I love the design of these products. Do you know if they’re available in the US? I previously posted on your Aveda Men’s Invati post and it just didn’t really work for me, unfortunately. I have fine wavy hair and a lot of it, that frizzes all too easily. I actually just started a new line of haircare products by Brigeo. Currently using their Curl Charisma Shampoo, Conditioner, Leave-In, and they also have an Avocado Co-Wash. Don’t know if you’d be interested in looking into those? They’re all natural and great for the environment. As for hair cremes, I’ve really grown to love Bumble and Bumble’s Grooming Creme. It smells very masculine and has a very light hold. You may also like to look into that… Just sharing you what works for my fine hair as well. Love your blog, thinking about starting my own! I don’t think they are unfortunately, but you never know! That’s such a shame RE: Invati, what did you find didn’t work? Did you just need a little more moisture? I have to admit I haven’t come into contact with Brigeo before but will have a look to see if they’re available in the UK – always love finding a new brand. Will 100% try the grooming creme, it sounds our hair is probably quite similar so will look forward to trying that one out! Thanks for your lovely comment Evan! Re: Invati: Yes, I just needed a lot more moisture for my wavy hair. I have a feeling you will love New Wash too. I’ve had a lot of good luck with it. Really want to try Rahua as well, is at as gentle as you say it is?